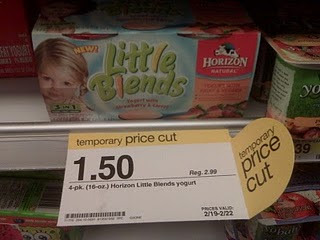 Here’s a great deal on Horizon Little Blends Yogurt select flavors that you might find at your local Target store (always keep in mind that this price reduction could be regional and therefore not at your own store). Be sure to scan yours so that you do have one that is on price reduction. Then, here’s how to get a GREAT deal on these. * Pick up something else in the store worth at least $0.50 so that the coupon isn’t adjusted down to account for your overage. Again – this deal is possibly regional, but it is certainly something worth checking out the next time you head to your store!